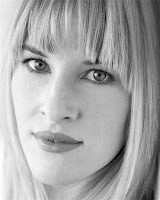 Megan Byrne speaks to playwright Kate Mulvany about sharing a personal story on the stage. We’re pretty excited that five of our twelve mainstage productions this year are Australian works. Hot on the heels of the classic Summer of the Seventeenth Doll comes The Seed by Kate Mulvany. This gripping exploration of the family fable is based on Kate’s personal story, and it took a certain amount of emotional and mental preparation to share it with audiences. The play touches on the emotionally toxic effects of war, along with the chemically toxic. Was it difficult to ask and to hear about war from a veteran’s perspective, but then also to write openly about your personal experience, knowing it would all be shared publicly? Or was it somewhat cathartic? The most important thing to me during the development of the piece was that I got my facts absolutely right. And that was hard, because veterans and their families are deliberately told very little about their health issues – mine included. So I tried to keep my emotions very much in check. I didn’t want personal emotion to get in the way of truth. I didn’t want to write an ‘angry, political play’. I loathe angry, political plays! And so I wrote a play, full of life, love and humour, about the toxic tragedy of war within a family. Looking back, I probably didn’t experience catharsis until after The Seed began and veterans, their families and the general public came in droves to see it and share their feelings. The veterans would say, ‘Thank you.’ The general public would say, ‘We had no idea this was happening.’ Either way, people listened and now they know. That brings me great catharsis. You’ve said that The Seed sees ‘three very different soldiers spend a funny and frightening day together with their demons and dreams’ – can you elaborate a little more on that? I guess it’s a challenge, first and foremost, on what it is to be a ‘soldier’. Are you still considered one after you’ve completed the battle? Or do you become even more of a soldier when the battle continues inside your brain, inside your body, within your conscience? In The Seed, we have a Vietnam veteran, an IRA soldier and a character who has never stepped foot on a battlefield, yet deals with the generational consequences of war on a daily basis. Is she a soldier? I believe so. But humour and horror are vital elements to getting the story right (and giving people a great night in the theatre) and so The Seed is both ‘funny and frightening’. Partly because that makes an audience come along for the ride, but mostly because a family of soldiers will rely on a certain gallows humour to get them through any reunion. 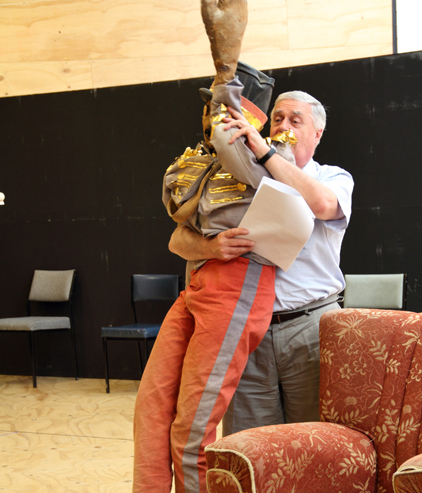 Max Gillies in rehearsal. Image by Pam Kleeman. The laptop that you first started writing the play on was stolen – which must have been an awful experience – how do you manage your script-writing now? Oh, God. I email myself everything. And I get my techno-whiz boyfriend to put it on every hard drive available within a 20km radius of our house. We’ve heard that the play is currently being adapted to film, with a potential UK season on the cards – can you confirm this? You played the role of Rose in the initial productions and the tour – will it feel strange to watch someone else in the role this time? Or are you looking forward to it? Funnily enough, even for the initial production I was my own fifth choice! I really didn’t want to play Rose, but I am so glad now that I did. Performing in The Seed for so long was fabulous, exhilarating and exhausting and I’m so ready to hand over the reins. I’ve never actually seen the show! I simply cannot wait to sit down with the audience and watch it with my family. And Sara Gleeson is every writer’s dream. I know she’ll make Rose bloom. The play is incredibly moving, and shows that the effects of war last far longer, and touch far more people than we might realise, or visibly recognise. As the playwright, and an autobiographer, what would you want to share with people who aren’t sure whether to see the play, for fear it might hit too close to home? I can tell you this – whether you come from a family of soldiers like I do, or you are a theatre-goer that just wants a good story – The Seed will make you laugh and break your hearts, often at the same time. I didn’t write The Seed to wag my finger at society or politics. I wanted to make people think and feel and talk. (Isn’t that what theatre is about anyway?) The difference between The Seed and many other plays is that what you are watching is absolute truth. The people exist. The problems are real. The characters you are watching on stage may in fact be right beside you in the next seat. The conversation is long overdue, and I encourage you to take part. And although there are some moments that may hit people hard, The Seed was written from a place of hope, love, pride and truth. I wrote it wanting the audience to come out with their chests beating, their minds open and their heads held high, and I know in the hands of our wonderful cast and crew, that’s exactly what you’ll get. Sara Gleeson with Max Gillies in rehearsal. Image by Pam Kleeman. 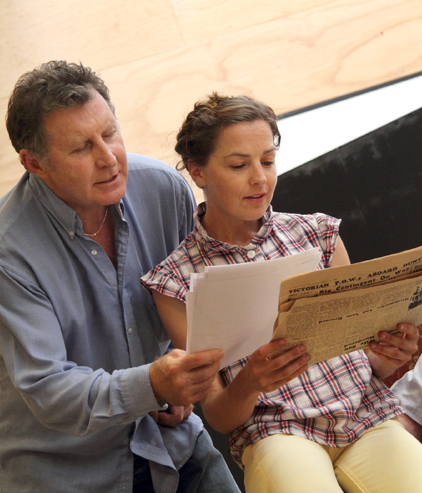 The Seed plays from 17 February to 4 April at Arts Centre Melbourne, Fairfax Studio.